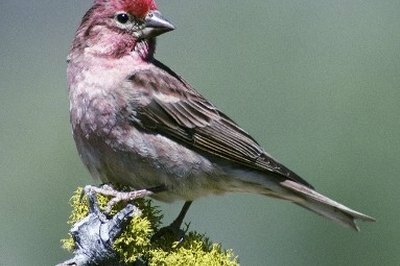 Finches are a favorite for birdwatchers everywhere. Their blue, red, purple or yellow body color makes them easy to spot, and if you look closely, you may even see some that have splashes of green or orange. If you want to attract these bright little buddies to your garden or yard, lure them in with thistle or sunflower seeds in this hanging sock feeder. Punch about 10 small holes in various places on the mesh. The birds will eat the seed from these holes so space them approximately 2 inches apart. Lay the mesh flat and place the leather cord about 3/4 inch below the top of the mesh, leaving an equal length of the cord extending from both sides of the mesh. Fold the mesh over the top of the cord and double-stitch the mesh just below the bottom of the cord. The cord is the drawstring on the top of the feeder. Fold the mesh in half lengthwise so that the ends of the cord are on the same side. Double-stitch the open side starting from below the drawstring cord to the bottom of the mesh and across the bottom. Fill the sock with thistle or sunflower seed. Pull the drawstring cord to close the top and tie a single knot near the closure. Tie the ends of the drawstring cord together. Hang the feeder outside where finches will find it. Although she spends her professional life as a legal technologist, Jacqueline Hills has a passion for writing and media studies. Her experience includes several years as a corporate technical writer and as an online freelance writer. She began her "writer's education" working for a local newspaper.